The mystery behind Malaysia Airlines MH370 flight incident results to other speculations, 'otherworldly' advice and prophecy. A Youtube video has surfaced, claiming that Nigerian preacher T.B. Joshua predicted the MH370 incident on July 28, 2013. The video was captioned: "Prophet T.B. Joshua gave a prophetic message concerning an Asian nation - warning them of an incident, involving a large aircraft, carrying over 200 people, developing a fault soon after take off." The video was uploaded on Sunday, March 8, 2014 by Emmanuel TV, a Christian TV Network headquartered in Lagos, Nigeria and founded by T.B. Joshua of the Synagogue Church Of All Nations following the MH370 flight incident on Saturday morning. The video has now gone viral and the question regarding the prediction has been published in several international news websites. In the prediction he says the incident with the flight would be caused by "impatience" in addressing a fixable fault with plane. 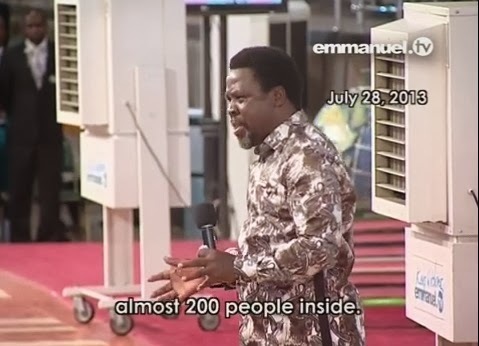 "We have to pray, this is an Asian country," said T. B. Joshua in the run-up to his prediction in the video. "I will not mention any country but God showed me the country. I am seeing a very big balloon. What is the cause of this? It was just about to take off and the fault started. It means they can discover it on the tarmac but because of impatience. "If God gives me the grace I will send a letter to the embassy of the country. Check your airlines in your country," he warned the audience. "But it's going to be huge. Almost 200 people inside. What happened here is the fault of impatience because there are many things they need to look into before they take off but they are unable," he claimed. Meanwhile, Bernama, a national news agency in Malaysia, reports that well-known Malaysian healer Ibrahim Mat Zin - known as Raja Bomoh Sedunia Nujum VIP - has landed at Kuala Lumpur International Airport (KLIA), to help find the plane using spiritual means and prayer. Ibrahim claims to have been invited by a national leader. He also said he uses a fish tap hook and bamboo binoculars to aid his search for the victims. In addition, a Psychic from Malaysia predicted that 'people will be walking out from the wild into civilisation' in a day or two. He advised officials to 'search inland around Ca Mau, where he said there's a field 'just enough for a plane to land'. He says the MH370 plane will be found in 'the snowy mountains' of U Minh Thoung National Park in Vietnam. The park is an 80 square km region in the southwest tip of Vietnam. Another story surfaced online as an oil rig worker working off the south-eastern coast of Vietnam claims to have witnessed the crash of the missing Malaysia Airlines plane. However, the search and rescue teams on their expanded search operations still failed to get trace of any evidence. The mystery of Malaysia Airlines Flight 370 appeared to deepen as reports emerged that passengers' cell phones continued to ring long after the flight went missing. However, technology industry analyst and "E-Commerce Times" columnist, Jeff Kagan said: "Just because you're getting ringing, just because the signs that we see on these cell phones, that's no proof that there's any -- that's just the way the networks work." Flight MH370 took off from Kuala Lumpur International Airport, cruising altitude, around 35,000 feet, just after midnight on Saturday and it has since disappeared which has left investigators, aviation experts and the authorities in several countries at a loss to explain what happened. There were 239 people on-board.